Torsion FACTORY GRAPHIC KITS are made out of 15mil back-printed vinyl to give your bike that personal touch while keeping your bike new and fresh! All kits feature super strong 3M adhesive to make sure that your investment doesn't just peal away! 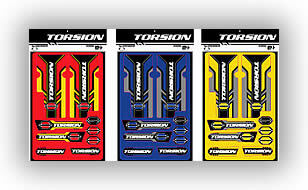 Torsion FACTORY GRAPHIC KITS come with instructions for easy application.